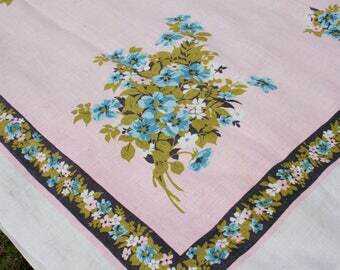 This is a cool vintage floral fabric! 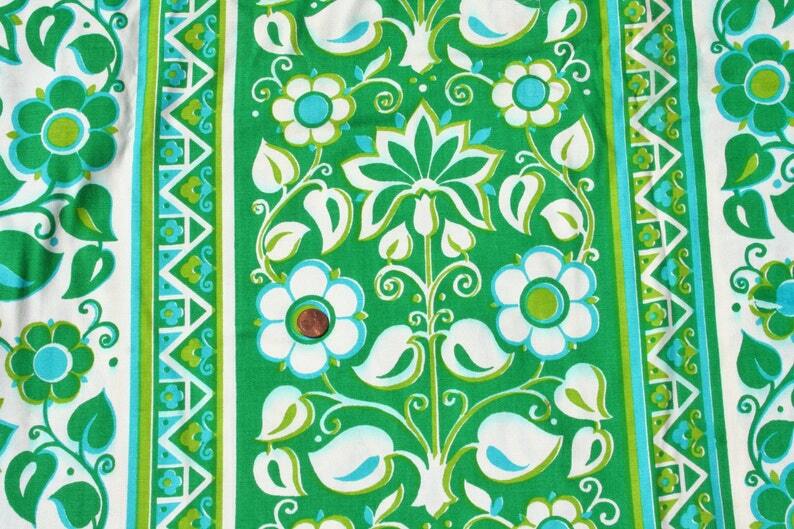 It is a very thick, heavy cotton (like canvas or duck) and it is printed with mod flowers in dark green, lime green and turquoise. It's a wide stripe print with the one stripe background in green and one mirrored in white. Along the selvage it says "Capistrano Stripe." This fabric looks like it's straight out of the Brady Bunch house! Lots to work with here! This fabric is in good, but not excellent condition. It has some flaws from production - some breaks in the ink and some color transfer that looks like shading. Some sections are perfect; others not as much. Regardless, there is lots here so you can enjoy it as it is or pick and choose the best aspects. Measurements are 48 inches wide by 5 yards. Note: This fabric is very heavy. For international shipping please contact me for a shipping quote to your specific location.